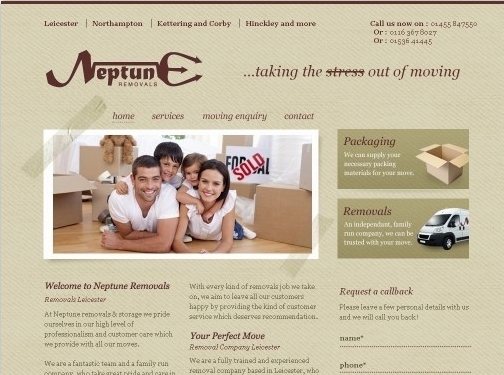 Neptune Removals are a fully trained and experience removal company in Leicester. As a family-run, independent company, they can be relied upon to save you time and effort when it comes to moving house. Neptune Removals offer a range of packaging options, ensuring that your moving day runs as smoothly as possible, so that all you have to worry about is where to put that lamp shade. UK (Barwell, Leicestershire) based company - established over 20 years ago - providing removal services. Website includes details of services provided, geographical areas covered, full company contact details. Company website has been online since 2009 according to web.archive.org.